After the Restoration of 1868, the new Meiji government addressed the task of creating an education system that would produce individuals capable of leading Japan towards westernization, the achievement of economic and military strength, and the promotion of industrial production. In 1872, the government promulgated an Education Order that laid the foundations of a new school system. Members of the Morita family had for generations acted as the headmen of Kosugaya Village. The eleventh-generation head of the family, Kyuzaemon XI (known after retirement as Meiki), believed that education would be vital to the Japan of the future. He was particularly passionate about the education of children, and with the promulgation of the Education Order, he began to devote his efforts to the establishment of a village school in Kosugaya. He invited Miki Mizoguchi (1852-1933) to become the schoolmaster. Miki, the son of a priest at the Ise Shrine (the foremost Shinto shrine in Japan), was a young man whose great talents had won him a high reputation. Inspired by Meiki's ideals, and receiving both material and moral support from him, Miki respectfully accepted the invitation and thus came to spend his whole life in Kosugaya. The Primary School Law promulgated in 1886 stipulated that a "higher primary school" should be established in each county to provide a further four years of education for those who had completed first-level primary education. The Chita County higher primary school was located in Handa, which was too far from Kosugaya for children to be able to walk there and back every day. Miki expressed a wish to offer a more advanced education to those with a real love of learning. 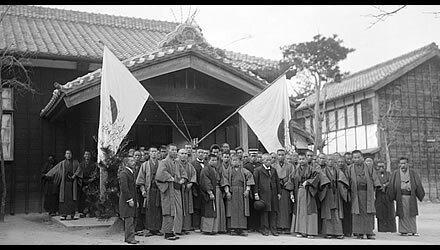 Meiki was persuaded, and in 1888, he founded a private school called the "Raykay Gijuku School" and appointed Miki principal. Meiki developed close friendships with leading figures of the day, such as Yukichi Fukuzawa, founder of Keio University, Yajiro Shinagawa, who had been taught by the great political thinker Shoin Yoshida, and Kaoru Inoue, later one of the drafters of the constitution of 1889, who had been educated at the Meirinkan, the school of the Choshu domain. Meiki decided that he wished to introduce the new education to Kosugaya. Meiki provided assistance for the building of a schoolhouse, for tuition fees, and for a dormitory. The School's reputation among parents and guardians grew, and Miki's devoted pupils were to be found throughout the Chita region and as far away as Mikawa. Defined in modern standards, the age of boys and girls at the Raykay Gijuku School was the same as those currently in the upper grades of primary school and the lower grades of junior high school. The content of the education offered, however, was extremely advanced. Japan had recently been opened up to the "civilization and enlightenment" of the west, and Japanese literature, Classical Chinese, English, mathematics, science, and book-keeping were taught in this country village of Kosugaya at the same standard as in a modern-day high school. The school also used Heishu Hosoi's 1835 treatise on the education of children, Omeikan Iso. The advanced curriculum was based on Miki's hand-written textbooks. In physical education periods the pupils were even taught baseball, which was extremely unusual at the time. The official name of the school changed from time to time. The schools that existed during the nineteen years from 1888 to 1907, however, are known by the overall name of the "Raykay Gijuku School," and Miki Mizoguchi served as principal or head teacher throughout this period. During these years, more than 350 pupils graduated from the school. Among them were notable figures in a wide range of fields, including: Taizo Ishida, renowned for bringing Toyota Motors back from the brink of collapse in the 1950s; Zenpei Morita, first president of the Shikishima Baking Company; Enkichi Ito, principal civil servant in the Ministry of Education, who worked hard for the establishment of Nagoya Imperial University; Rohei Ishiguro, father of the Modern Standard Japanese language; Nobuei Morishita, the 5th Captain of the battleship Yamato; Makoto Enomoto, who did important work on egg production in poultry; Admiral Shiro Furukawa of the Imperial Japanese Navy; and Junkichi Amagi, Assistant Professor at Tohoku University. Many Raykay Gijuku School graduates followed Miki Mizoguchi's example to become primary school teachers and principals.